“Sympathized deeply and livingly with the seed in the Monthly Meeting at Uxbridge. Found great relief in watering the thirsty.” – Job Scott, Quaker Minister, November 1790. He had just turned 40, and had two years of life left. There was, as is the tradition here, a time of “Quaker silence” – we were asked to listen to the Inner Teacher, and reflect inwardly. And yet… one Friend, a member of nearby Smithfield Meeting, rose and shared a message. I’m not sure if it was expected, but it was certainly Spirit-led and ministered to us the gathered body. We had been reminded earlier that folks often had “varying perspectives” in the world, which of course is true – and to hold those opinions in Love. I heard this Friend’s message as a prophetic answer to that. Yes, we must always respond in Love, but there is in fact a moral imperative that we not merely assume all perspectives are equal. Those centered in the Love of our neighbor, not rising from the seeds of war, are in fact weighted as our path in the Kingdom of God. The Friend quoted briefly from a Yearly Meeting Book of Discipline that he had found when he arrived. All thoughtful men and women are torn at heart by the present situation. The savage momentum of war drags us all in its wake. We desire a righteous peace….to preserve our sanity, we become apathetic. In such an atmosphere no true peace can be framed; yet before us we see months of increasing terror. Can those who pay heed to moral laws, can those who follow Christ submit to the plea that the only way is that demanded by military necessity? It spoke clearly to the condition of the world, then and now, as mired in the seeds of war. Here we were, celebrating love and peace and being together – and yet in this moment the prophetic call still rose. It cannot be otherwise if we are listening faithfully. 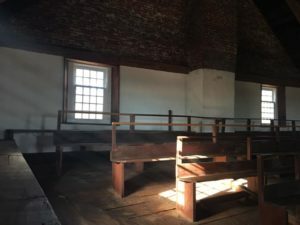 This particular Meetinghouse has a powerful history. Abolitionists, ministers, much Holy work in our world. However, we do not worship the meetinghouse as idol. It is the Spirit contained within, the Presence experienced then and now that we gather in the service of. Before I left the celebration, I headed upstairs. 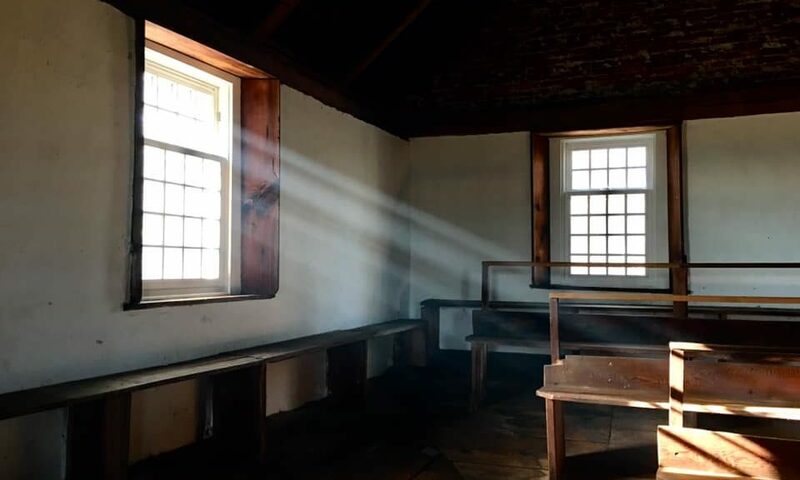 The light was streaming through the windows into the gallery, which in years past would have been filled many times a week with Friends seeking encouragement and strength. It was empty, and quiet. The air itself however had a thick quality of the weight of the history there for me. It was not a place I would want to stay – instead, in gratitude, I reflected on the this helpful stop on the journey. While no mere building can provide the answers that are needed – I was grateful to have a moment to (as Meister Eckhart suggested) say “Thank You”.